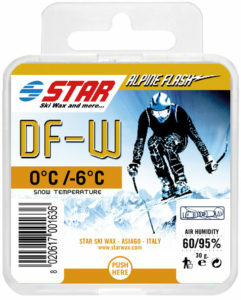 Three block 100% fluorocarbon waxes that should be applied over one of the waxes from the AF range and are recommended for high humidity conditions or fast changing snow. 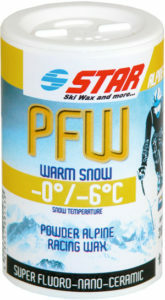 Indispensable wax for correcting skis for the second run when the snow is warmed by the sun and becomes moist. The block should be rubbed onto the base and then polished with a natural hand cork or a rotating cork applied to the drill. 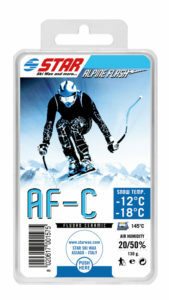 A new range of micronized powder with fluoro Nano-Ceramic Technology. 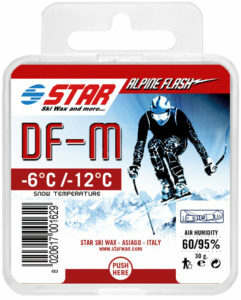 These waxes with a high fluoro content represent a revolutionary method in the way of preparing alpine skis. New additives give excellent speed and extreme durability in a wide temperature range of use. The presentation in micronized powder makes the waxing operation much easier with minimum product waste. The powder melts in quickly in contact with the waxing iron and penetrates into the base avoiding to cause ski tension. 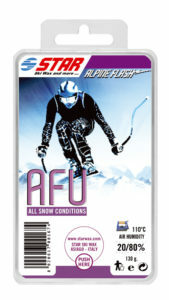 Flash is a new range of products entirely designed by STAR SKI WAX for competition and for all alpine disciplines. This line is unique due to the simplicity of use. 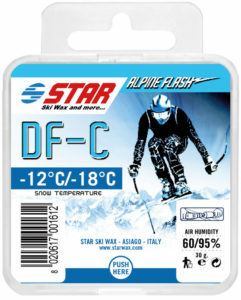 Only three products will help you prepare your skis in advance thanks to the wide temperature range, using only the reference of the snow temperature. 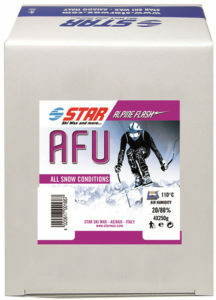 AFU: Mix of refined natural paraffin, AFU is a universal product for training and as a universal wax for all snow conditions. 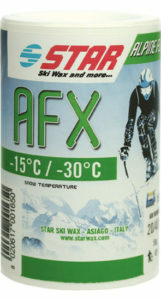 AFX: Extremely hard synthetic powder wax for icy tracks and for abrasive snow conditions. 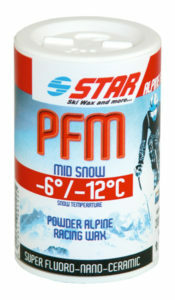 For high speed racing, apply this powder near metal edges to avoid base burning. 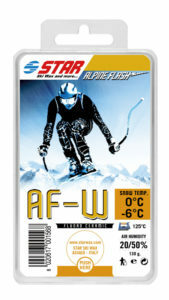 AFB: Friction with snow can whiten black polyethylene bases, causing a loss of graphite. 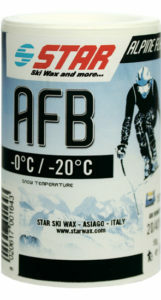 AFB contains a high percentage of graphite in a synthetic base wax which protects bases making them harder and faster. 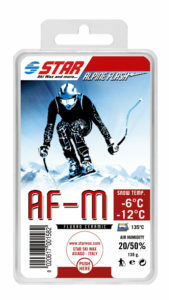 We recommend to treat your skis periodically with AFB.